Today I went to the Friends of Topsham Public Library’s book sale and bought a banned book! 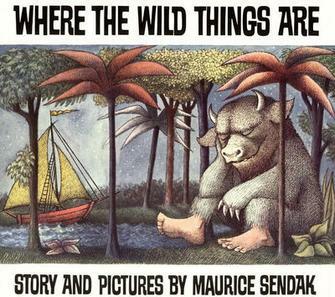 I purchased Where the Wild Things Are by Maurice Sendak for my niece and nephew. It was banned in many places but went on to win many awards including the Caldecott Medal. There have been many criticisms leveled at the book: that it is too dark and frightening, that it promotes witchcraft and elements of the supernatural, that it glorifies Max’s anger and ‘inappropriate’ behavior, that depriving a child food as punishment could scare a child, one psychologist even went as far to say that it would psychologically damage children. Sendak portrayed children as they are: mischievous and sulky and angry and scared and sometimes alone, and for this his books have been embraced by generations. I am also a big fan of the novel adaptation by Dave Eggers and the movie (directed by Spike Jonze) that inspired it, which I think are more aimed at adults who loved the book as children.